It’s not often you can visit Cadwell and be blessed with sunshine, but this time we were lucky. 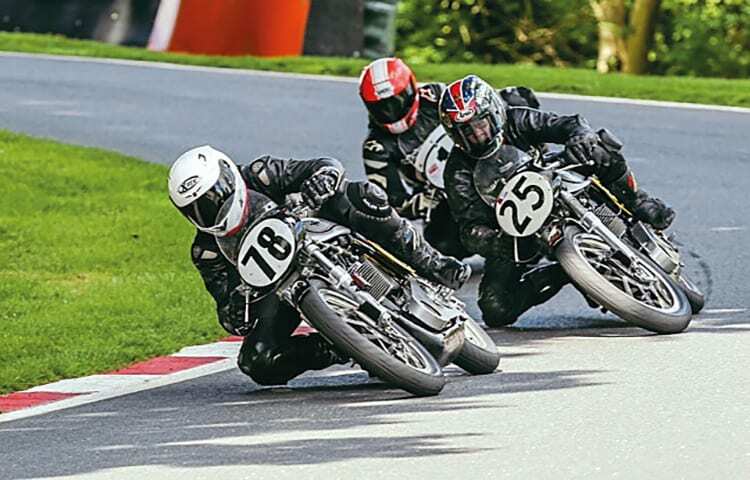 Dean Stimpson, the leader in the Bonhams Championship, took pole position on Nick Izzard’s Manx, with Glen English second on the SCC Works Manx, and Mike Russell third on Richard Adams’ Manx, followed by current champion Chris Firmin sporting the No. 1 plate on an ACR Manx. All the above were in the 1m 45s, so close racing at the front looked on the cards. The Museums WRR Championship saw Mike Farrall head Ian Bain and Chris Bassett, all on Manx Nortons with last year’s champion Seb Perez next in line on his G50. Race one saw Firmin in a determined mood, forcing Stimpson into second followed by Russell and young Sam Clews smelling a podium pushed his ACR Manx into fourth. Bain took the WRR class win from Bassett and young George Thomas rode one of Tony Dunnell’s Manx into third. Sam Rhodes continued where he left off last year, by dominating the TCM class on Graham Austin’s Velocette. A Saturday evening game of Lansdowne cricket, held at the far side of the paddock, was a serious affair with Rachel Russell smashing the ball around the field. Dean Stimpson took two bouncers in the wedding tackle and ‘Uncle Jim’ English, still having a great turn of speed, saved Mike Russell from being run out. Sunday morning was back to the serious stuff and at the pointy end of race two it was English, Firmin, and Stimpson riding the wheels off their Manx, quite often three abreast. It was Stimpson punching the air as he crossed the line ahead of English and Firmin. The WRR class saw Bain lead home Bassett and Perez. Race three again kept the spectators glued to the track action with groups of very close racing throughout the field. It was Stimpson and Firmin battling for the victory, with the latter taking the win by 0.165sec and Stimpson a new lap record with 1m 43.674sec. Next came English, Clews and Russell all within 0.649sec of each other. Five weeks later it was the Castle Combe round, always a favourite with riders and spectators, and there was a record crowd of 20,000 spectators around the circuit. I’m sure Mike ‘The Bike’ Hailwood was looking down on this gloriously sunny weekend meeting, with many of his bikes being paraded by star riders. Once again the Lansdowne Series proves to be the real crowd pleaser with pockets of riders fighting for position right through the field. At the sharp end Chris Firmin was wringing the neck of his ACR Manx Norton in a weekend long duel with Dean Stimpson, supported by English, Russell and Clews. Stimpson took all three race wins by a cat’s whisker, but Firmin got the fastest lap with a record 1m 20.484secs. The WRR class in race one continued to be dominated by Ian Bain, with a fastest lap of 1m 22.856 sec, but a broken belt in race two spoilt his record. This gave George Thomas a chance of glory and he took the win on a Tony Dunnell Manx. Geoff Leather’s trip from the Isle of Wight was worthwhile as he took all the Avon Tyres 350cc class honours. Sam ‘Rodeo’ Rhodes continued his winning ways on the ever reliable Austen Velocette in the TCM class. Thanks to the faithful sponsors, The National Motorcycle Museum, Bonhams Auctioneers, Avon Tyres and The Classic Motorcycle Magazine.